Tuesday allowed me to rest for a bit. I slept until about 11:00, and it felt great. After getting up I ate breakfast, wrote the blog post for Monday’s game, finalized the business card and placed my order. I was hoping to have them in time for the trip to New York on Monday, but I found out it wasn’t doable anymore. I shouldn’t have waited as long as I did, so I have no one to blame but myself. I went to the game with Crandall, whom I went to the game with on April 24th. 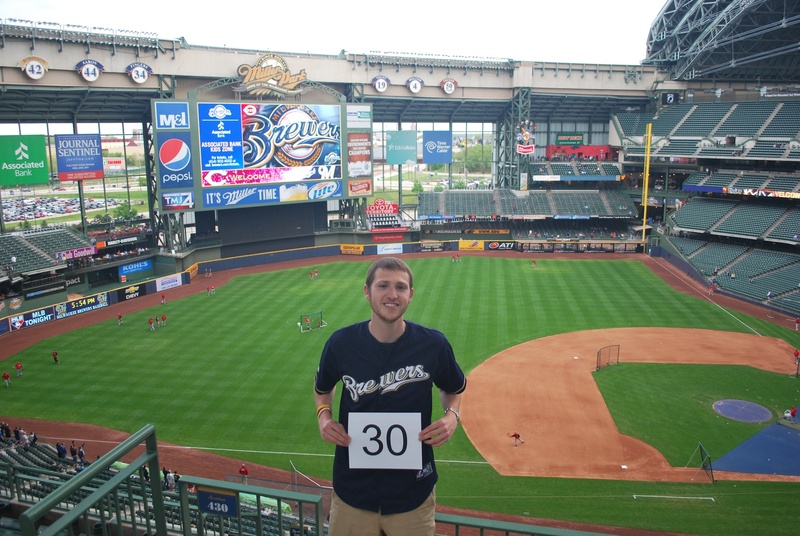 I picked him up at 4:25 from his place in Fort, and made it to Miller Park by 5:38. We went to section 430 in the upper deck, for game photo number 30. After looking at this picture, I don’t know if I can make it the full season without shaving. That was the original plan, but seeing this picture makes me doubt that I can put up with looking like this (and it will get worse) for another five months. Crandall and I walked down to section 115, because I was going to be meeting up with a few people. We didn’t see them, and as we were walking in the cross aisle we crossed paths with Jill Aronoff, the Brewers director of merchandising. 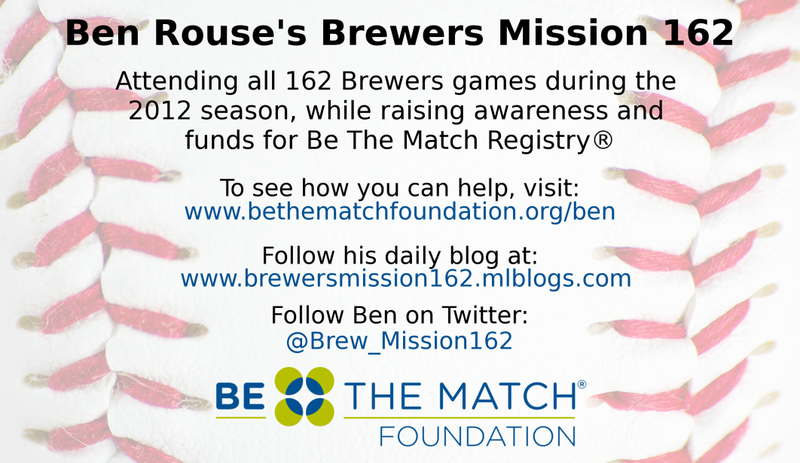 I’ve mentioned her before, and she has helped pass along the licensed merchandise that the Brewers are providing. 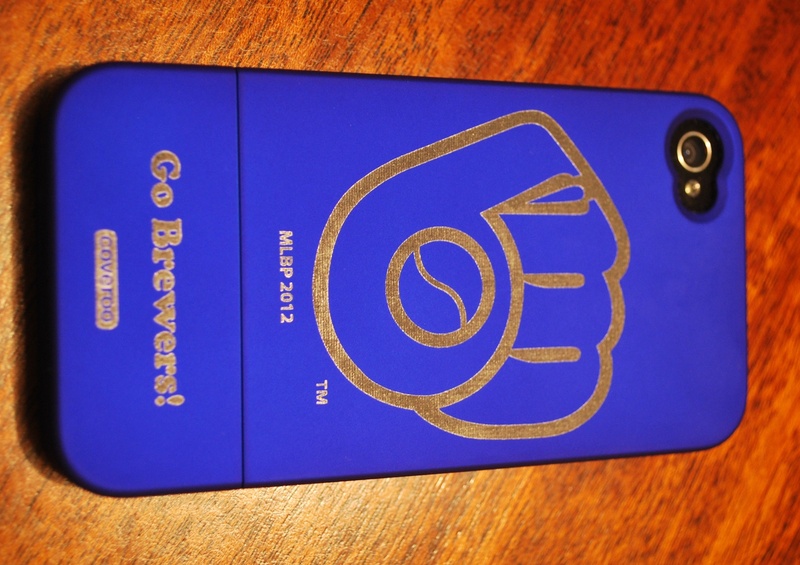 She showed me her phone and said the Brewers now have an etching machine to engrave cell phone cases. She asked if I wanted one and I was really skeptical, since I’m completely satisfied with my iPhone 4 “bumper”. Since we didn’t see the guys I was meeting up with, I agreed to head to the team store with her and Daniel, who works for Coveroo, the company that makes the engraving machine/software. It’s not just for iPhones, and there are many phone models that are available, I chose the ball and glove logo, and had Go Brewers! engraved in the bottom part. This picture below shows the machine in action. You can’t see it, but it’s using a laser to burn off the top layer, which exposes the silver layer underneath. 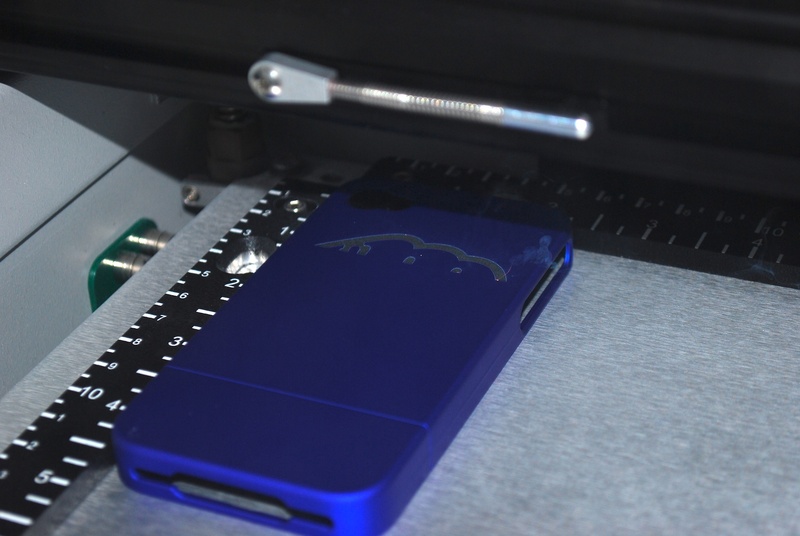 You can see the little bit of smoke on the far right of the case, as the laser works its way down. It takes about three minutes, and the finished product is pretty sweet. So if you’re interested in getting a custom made cell phone case, stop by the team store by Friday’s front row, and take a look for yourself. They cost $30, and after seeing the quality of the engraving and the case itself, I think it’s worth it. After thanking Jill and Daniel, Crandall and I went back to section 115, to see if the guys were there yet. I was meeting with Eric, Eric, and Larry. Eric McLean is also a leukemia survivor, and is battling for the seventh time now, after countless relapses. He was originally diagnosed at 18 with Acute Myelogenous Leukemia, and has received three stem cell transplants. If you want to read about his story, you can CLICK HERE. He’s one hell of a fighter, and he’ll be in my thoughts for the remainder of the season. 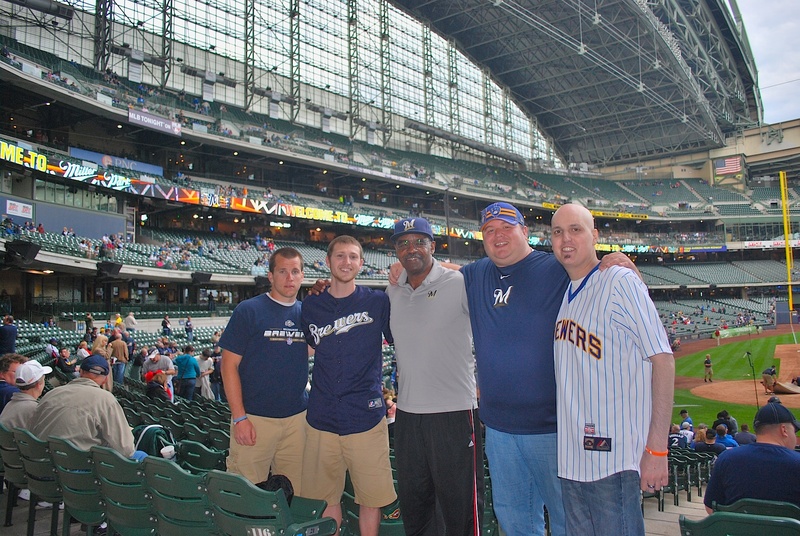 I chatted with him and Larry Hisle, who played for the Brewers over parts of five seasons. Injuries prevented him from finishing his career the way he would have liked, and he only played in 79 games over his final four seasons in the majors. He’s got two World Series rings, as a member of the Toronto Blue Jays coaching staff, when they won in 1992 and 1993. The five of us got a picture together, and from left to right you have Crandall, myself, Larry Hisle, Eric, and Eric Mclean. Crandall isn’t the most photogenic, but after showing him the picture he said he was just glad that his eyes were open. Larry and the two Erics had seats in 115, and after we said our goodbyes Crandall and I headed up to section 221, and got situated for the game. The Brewers got off to a great start when Lucroy laced a two run single to center in the first inning. They added one in the second, when Braun hit a ground rule double to left. There had been runners on first and second, and Weeks would’ve scored easily from first since he was on the move with two outs. Aramis followed with a pop out, but made up for it when he tripled in the fourth and drove in three runs. I think Uecker once said that the bases clearing triple is the most exciting play in baseball, and it’s hard to argue. You’ve got four guys sprinting around the bags, and a fielder racing to try and limit the damage, good stuff all around. The Brewers added a run in the fifth, the Reds two in the sixth, and the Brewers got one back in the seventh on a César Izturis home run. Earlier in the game when he came to the plate I had jokingly said to Crandall; “here comes a power threat.” We wondered how many career home runs he had, Crandall guessed 14, me 9. After a quick search on the web I learned that he had 15 at the time (in 4,083 at bats!). That’s one in every 272 at bats. I’m guessing that he had heard our discussion (from 200 feet away), and in the seventh inning he wanted to make us eat our words. The Reds added a meaningless run in the 8th and the Brewers won going away. Final Score: Brewers 8 – Reds 3. I’ll be at Miller park in ten hours for the 12:10 rubber match. I’m hoping that Greinke and the Brewers can get a win tomorrow to secure a series win, something they’ve only done 3 out of 9 times thus far.